Estimates show 2016’s audiobook sales growth expanding by almost 20 percent again. 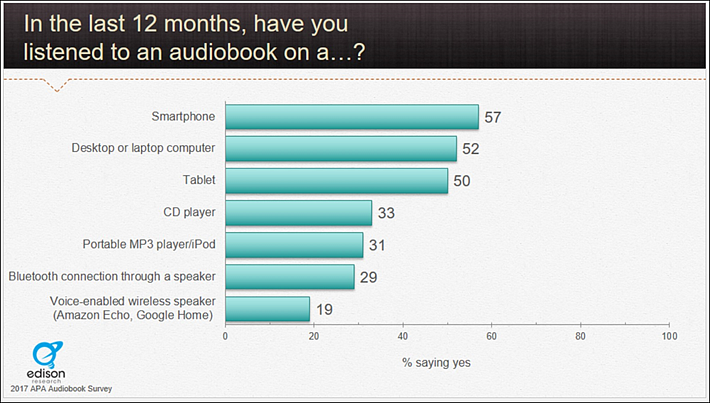 The APA cites 24 percent of Americans saying they’ve completed an audiobook in the last year. In covering the BookExpo conference session “Consumer Centric Data: The New Currency of Publishing,” Publishing Perspectives referenced a coming report from the Audio Publishers Association (APA), which has been released today (June 7). 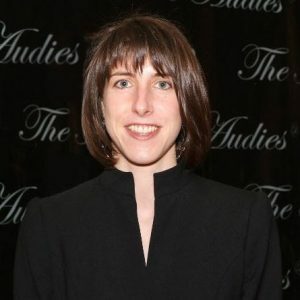 The association’s Michele Cobb delivered at BookExpo some of the most compelling observations of the day in terms of consumer response to audiobooks, as well as the kind of upbeat numbers we’ve come to expect from audiobook publishing. The association conducts its annual survey with the research firm Management Research, which polls industry sales data “including gross sales, sales by various formats, and channel discounts,” covering the national APA audio-publishing membership. What’s more, Cobb’s information is based on a survey from January and February in which Edison Research was commissioned to survey 2,000 respondents via telephone, establishing the US audiobook market’s outlines on the basis of such parameters as (a) how many said they’d ever listened to an audiobook; (b) when these respondents said they’d last listened to an audiobook; and (c) the number of audiobooks they said they’d listened to in the previous 12 months. One of the most helpful things the association does is estimate the growth of the audiobook market. In an industry in which “consumer centric data” is not always available–the terminology of “estimates” is welcome. Below are some of the survey’s additional findings, which marketing and audience-development professionals will find particularly interesting. 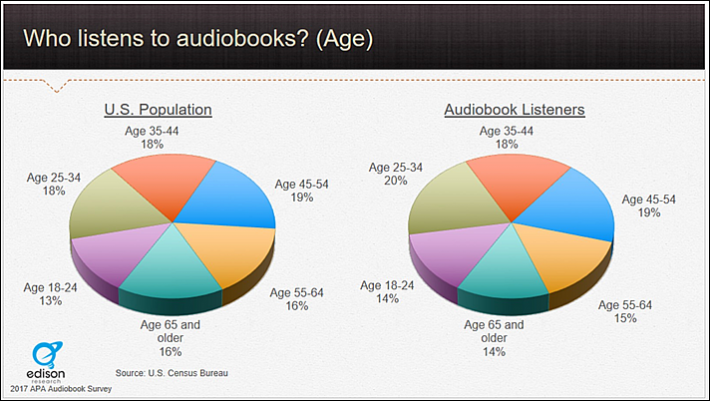 “Nearly half (48 percent) of frequent audiobook listeners are under 35. 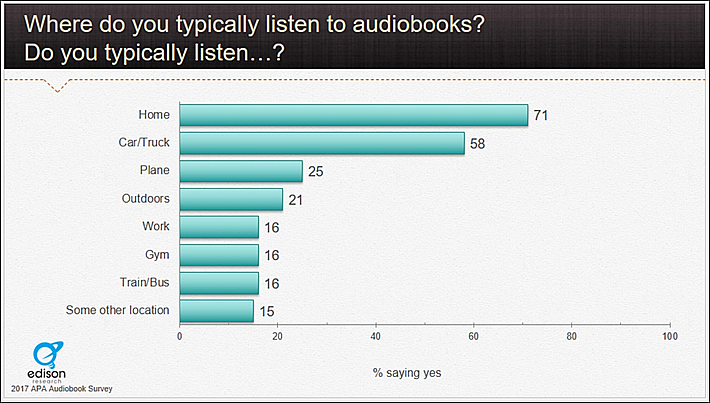 “Audiobook listeners are often also podcast listeners. Respondents who consumed both podcasts and audiobooks listened to twice as many audiobooks in the past 12 months as non-podcast consumers. How and Why Were They Listening? 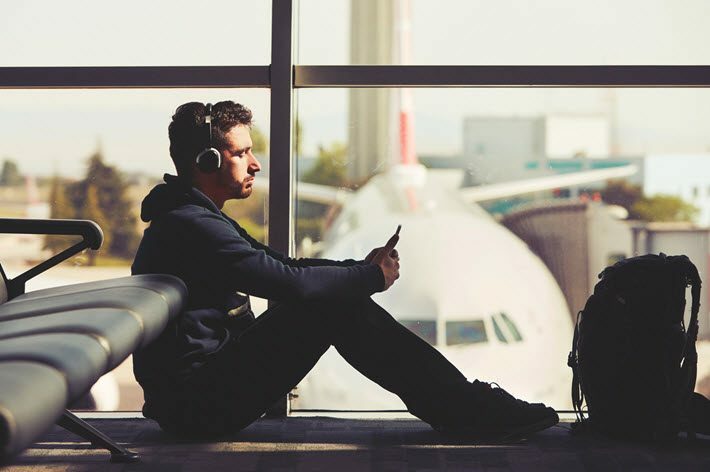 In what may be one of the most striking findings of the survey, the APA was told by 56 of its respondents that when they listen to audiobooks, they’re not doing anything else, “just listening.” This will come as a surprise to many of us who are accustomed to thinking of audiobook listening as something done with other activities–commuting, working out, and so on. “Far more listeners are saying they use their smartphone most often to listen to audiobooks than before–29 percent in 2017 vs. 22 percent in 2015. “A majority of audiobook listening is done at home (57 percent), with the car being the second most frequently-cited location (32 percent). 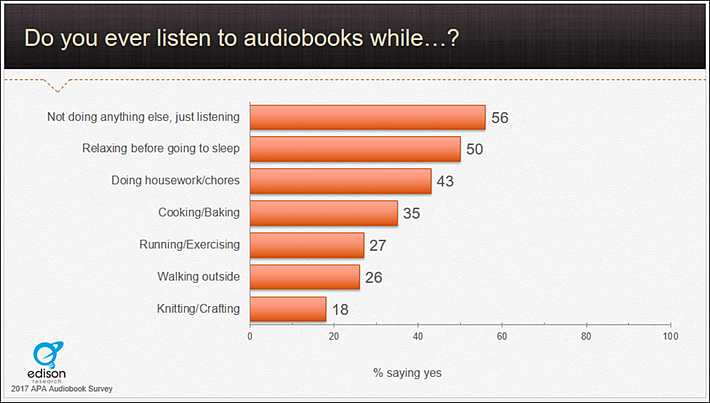 • 68 percent of frequent listeners do housework while listening to audiobooks. Other multitasking activities among frequent listeners include baking (65 percent), exercise (56 percent) and crafting (36 percent). Cobb appeared on the “Consumer Centric Data” panel with OverDrive‘s David Burleigh, and was able to agree with him, as you’ll see in the first point below, on indications that book discovery is occurring at libraries. 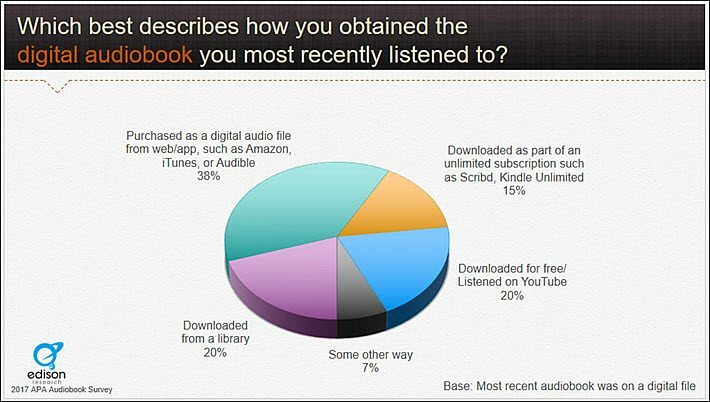 “Libraries remain major access channels and important drivers of audiobook discovery. Twenty-seven percent of people said borrowing from a library or library site was very important for discovering new audiobooks. “Of the more than 50,000 titles produced on audio in 2016, the most popular genres were mysteries/thrillers/suspense; science fiction/fantasy; and romance. In question-and-answer after the BookExpo panel, Cobb revealed that the association’s input indicates that listeners can consume a book “that’s two years beyond what you can read with your eyes,” she said. “It helps you understand context, vocabulary, and pronunciation,” which, of course, could be potentially critical in the challenges of some who have reading disabilities. In answer to another question, she said that the association is seeing an increased number of celebrity narrators at work in audiobooks, some of whom are attached to their own projects (memoirs, etc.) and some of whom are simply able to raise a book’s profile, as in the case of Reese Witherspoon’s narration of Harper Lee’s Go Set a Watchman for HarperCollins. More information on audiobooks and the APA is at its site.